Cardiac arrest, which is what occurs when the heart stops pumping rhythmically and your patient no longer has a pulse, can be difficult to predict. Therefore, it’s often called sudden cardiac arrest, or SCA. However, as a trained health care professional, you should always be prepared for unexpected events such as this and should guard against them by being able to recognize certain signs and symptoms as well as risk factors that could lead to a code if not addressed immediately. Here are the top risk factors you should be on the lookout for in your patients. 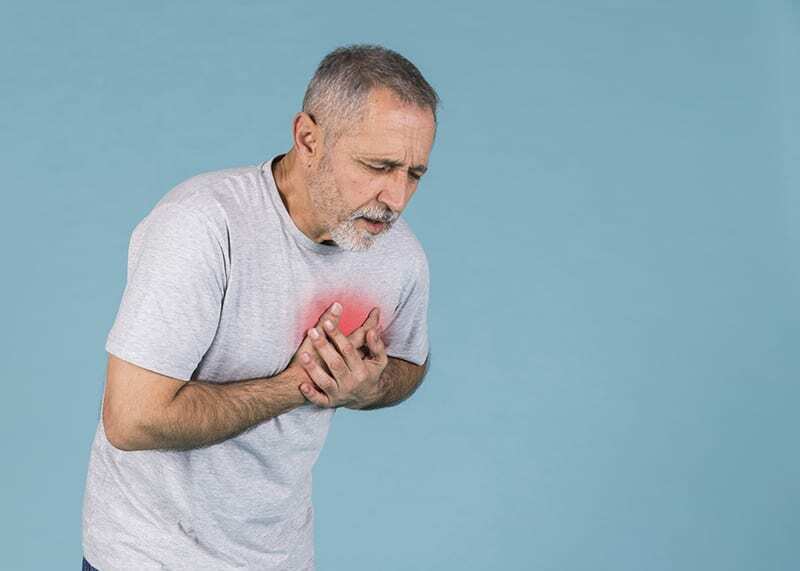 If your patient presents with a heart attack or even if he or she has had a heart attack in the past, this patient is at increased risk of sudden cardiac arrest. During a heart attack, a portion of the heart muscle is damaged. This makes the heart work less effectively than usual. A heart attack is even more dangerous when it affects the area of the heart muscle where the heart’s electrical system is located. Without the right electrical impulses maintaining proper EKG waveforms, your patient could quickly code. Your patient may also present with significant coronary artery disease but without a heart attack diagnosis. This is still a significant finding because it shows that your patient’s arteries that feed the heart muscle with freshly oxygenated blood are clogged. When the heart cannot get the life-sustaining blood that it needs, a heart attack and, thus, the risk for SCA is quite real. In congestive heart failure, the heart is not pumping as strongly as it once was. Pay close attention to your patient’s ejection fraction if one is on record. A good ejection fraction, or EF, is 55 percent or higher. An EF of 40 percent or less could be an indicator of imminent problems. Studies have shown that these patients are up to nine times more likely than the general population is to arrest suddenly. It’s vital that you read about your patient’s background. This can give you important information about your patient’s past health as well as the health of his or her closest family members. In particular, pay attention to heart-related diseases that family members have. Family history of sudden cardiac arrest, sudden cardiac death, heart attacks or heart failure are particularly meaningful. There are many other factors that could put your patient at increased risk for SCA. Congenital heart problems that have been with the individual since birth may eventually translate into big problems in the future. Cardiomyopathy, which is an enlarged heart, fainting spells, drug use and obesity are other significant risk factors. While you shouldn’t treat every patient as if he or she is imminently going to code, knowing these risk factors will help you stay on the alert and will help you know which patients are most important for you to monitor closely. If your patient presents with any of these previous diagnoses or has currently been diagnosed with one of these diseases, you should be aware that your patient has an increased likelihood of coding. Therefore, you should keep a closer eye on these patients, monitoring them with EKG leads as needed, taking frequent blood pressure readings and other vital signs and staying in close communication with your patient’s physician when new symptoms present. In this way, you can be your patient’s best advocate and can also feel prepared for anything new that may come your way. Unsure of your EKG/ECG reading skills? Gain confidence with our Basic ECG Interpretation and Pharmacology Certification, a classroom-based, facilitator-led course designed to improve electrocardiogram (ECG) recognition skills and pharmacology knowledge for treating cardiovascular emergencies. Wanting to expand your EKG/ECG reading skills? Project Heartbeat offers Advanced 12 Lead EKG Interpretation Certification to provide healthcare professionals the ability to interpret 12 Lead ECGs (electrocardiograms) and recognize myocardial infarction (MI).